Rare singular map of Rhode Island. 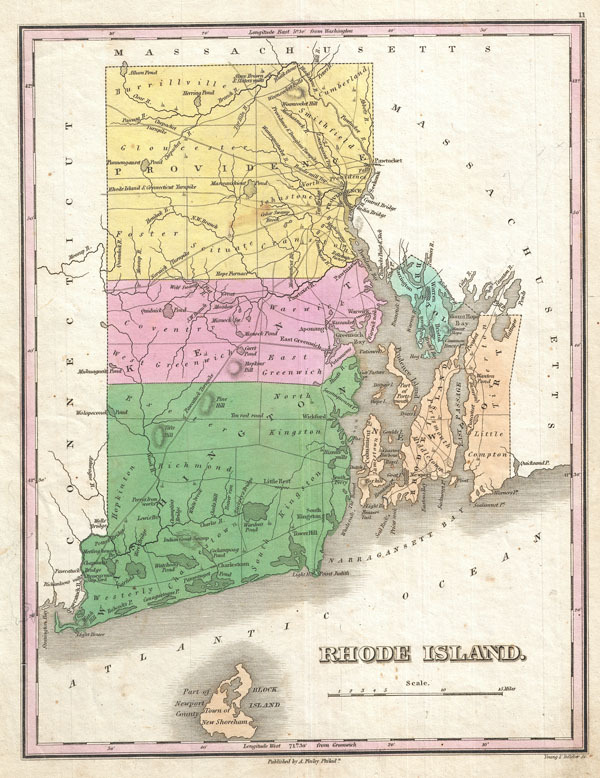 A beautiful example of Finley's important 1827 map of Rhode Island. Includes Block Island. Depicts the state with moderate detail in Finley's classic minimalist style. Shows river ways, roads, canals, and some topographical features. Offers color coding at the county level. Title and scale in lower right quadrant. It is very uncommon to find an early 19th century exclusively depicting Rhode Island, as most maps of the period bundled it with Connecticut or Massachusetts. Engraved by Young and Delleker for the 1827 edition of Anthony Finley's General Atlas. Chapin, H., Contributions to Rhode Island Bibliography, No. 5: Checklist of Maps of Rhode Island, 61. Rumsey 0285.011 (1831 edition). Phillips (Atlases) 4314, 760, 752, 6045.